Enjoy this full day, small group, luxury minibus/train tour of The South Downs National Park and The Seven Sisters. You will meet your guide in London at London Bridge Station at 08:45 and take the 65 minute train to Brighton, here you will join a luxury minbus where you'll be driven through the majestic Sussex countryside. Our tour will take in the highlights of the South Downs National PArk and the Seven Sisters Cliffs, stoping in 7 different places to make the most of your day. Your friendly river/guide, will meet you at London Bridge Train Station in central London. Once everyone is together, you will take the comfortable 65 minute train journey to Brighton where you will board the luxury minibus before heading out of the city and in to the South Downs. This ancient landscape is characterized by the rolling chalk hills, created over thousands of years by farmers grazing their animals. This "downland" is a rich landscape of flora and provides some of the most beautiful and dramatic scenery in the South of England. The first stop on the tour is the eerily named Devil's Dyke, high up on the Downs with views of up to 30 miles across the lowland Weald. Stopping for about 20 minutes, your guide will explain how this landscape was created and also show you the unique Devils Dyke, which is the largest dry valley in the UK. After Devils Dyke, you will head further away from Brighton to Middle Farm, a traditional Sussex farm that has been in the same family for over 200 years. Today, Middle Farm offers the largest selection of Sussex produce in its farm shop which includes a butcher, bakery, cheese counter and all sorts of other produce including English sparkling wine, cider and perry. There is also a cafe selling coffee if you want to grab a quick snack. The stop here will be 30 minutes allowing you enough time to have a good look around. The tour continues to the Seven Sisters Country Park and the white cliffs. Arriving at Seven Sisters and the majestic white cliffs, your first stop will be Beachy Head. 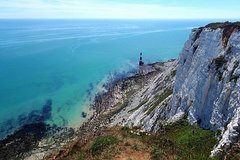 Your guide will walk you to the top of England's highest chalk cliff measuring 530 ft. The cliffs along this stretch of the coast are vertical adding to the natural drama all around you. There will be enough time to take photo's before continuing to the Belle Tout lighthouse for the amazing views back to Beachy Head. You will then head to Seaford Head, where the iconic view of The Seven Sisters can been seen from Seaford Head. Walking the lane from the car park to the coastguard cottages, the full beauty and drama of the white cliffs will appear before you. Make sure you have your camera ready, as you’ll be here for 30 minutes, plenty of time for pictures. Before returning to Brighton, one last stop is the village of Rottingdean, which was once home to Rudyard Kipling author of The Jungle Book. We will then take the short hop back to the city center, arriving back in Brighton at 5pm. On arrival in Brighton you have the choice of looking around the city before returning to London or you can be droppedat the train station.